On May 17, 1927, Mrs. Myrtle Ridgely resigned her position as clerk in the $2100 grade in the St. Louis Post Office. After three months, unexpected circumstances and developments prompted her to seek reinstatement to her former position, and due application having been made through the regular channels, she was advised by the postmaster that her application had been favorably acted upon and that effective September 26, 1927, she would be reinstated as junior substitute clerk at the foot of the then existing substitute roll. 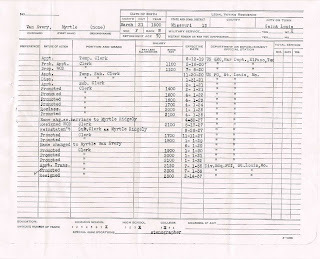 Not fully realizing at that time that this assignment meant substitute service at irregular and uncertain hours for approximately three years, she succeeded in having this assignment changed (due perhaps to her past good record in the service) and on November 11, 1927 was placed at the head of the substitute list and immediately appointed a regular clerk at the lowest entrance salary of $1700.00. In view of Mrs. Ridgely’s past experience in the service, which included actual distribution of mail, window service in the General Delivery Section, stenography and type-writing, accountancy work in the Money Order Division, and also the duties of a private secretary, it is hoped that you will be able to use your good influences to prevail upon the proper Departmental head in Washington to recommend the reinstatement of Mrs. Ridgely to her former salary grade of $2100.00. In further emphasis of the fact that I believe this to be a meritorious case, it might be well to call the attention of the proper Department to this clerk’s past as well as present service record, which I am sure will be found to be excellent, and one justly to be proud of. I have your letter of March 6, concerning salary increase for Mrs. Myrtle Ridgely, and for your information you are advised that the salary for the employees who are reinstated in the service, is fixed by the Department at Washington and is invariably fixed at a lower salary than was formerly received by the employee. I think that the Post Office Department at Washington feels that when an employee leaves this service as did Mrs. Ridgely to get married and later makes application for reinstatement, that there is no obligation on the part of the Post Office Department to reinstate them in the service and to restore to them their former salary. As a matter of fact they view it that the employee left of their own free will and therefore should be satisfied if they are reinstated in the service to receive the salary as designated by the Department. Mrs. Ridgely is an excellent clerk and will receive an increase of salary of $100. Each year until she reaches the maximum grade, $2100. I do not believe anything can be done to induce the Department to make an exception in her case by having her promoted as suggested in your letter. For your information, I am herewith enclosing you a letter, which I have just received from Postmaster Michener, and which is self explanatory. Reference is made to your call at the Department yesterday regarding the salary status of Mrs. Myrtle V. Ridgely, a clerk in the post office at St. Louis, Missouri. The records of the Department show that Mrs. Ridgely was originally appointed a clerk in the St. Louis post office on February 1, 1921, and resigned May 17, 1927, on account of having married. Mrs. Ridgely later separated from her husband and under date of August 8, 1927, made application for reinstatement. In accordance with Department’s policy and the recommendation of the postmaster Mrs. Ridgely was required to accept an assignment as a substitute clerk, foot of roll, subject to promotion in the first grade at $1700 per annum when made regular and her reinstatement under these conditions was consummated effective September 26, 1927. In order that you may have a better understanding of the matter I might explain that it is the policy of the Department to require a former employee who resigned from the service for personal reasons other than illness to accept an assignment as junior substitute upon reinstatement. This policy was placed into effect primarily to protect the interest of substitutes who are in training and looking forward to advancement to regular positions and who would be adversely affected where the Department to reinstate former employees to regular positions or higher places on the substitute roll. The records further show that Mrs. Ridgely was promoted to regular clerk November 11, 1927, at $1700 per annum and advance to the $1800 grade January 1, 1929. Even if the Department so desired it would not be permissible, under a ruling of the Comptroller General of the United States, to issue an ex post facto order increasing Mrs. Ridgely’s annual rate of pay. 1) I'm unsure who wrote the first letter above, as the only copy I have is the unsigned copy the author must have given my grandmother. Possibly one of the two Congressmen, or an unknown third person. However, the detail to which it goes in describing her past responsibilities is excellent. 2) My grandmother reverted to her maiden name in Post Office records on June 1, 1929. Since her divorce was final in October 1928, I suspect she was waiting so as not to confuse the Post Office while she petitioned for a higher grade. 3) She worked at the Post Office from Sept 26. 1927 until Feb 14, 1937, when she resigned again, after marrying my grandfather. She had achieved the $2100 salary grade on January 1, 1932. I'm sure during the Depression years she was glad just to have a job.